Engaging in outdoor activities is a great way to spend time with the family; therefore, it is important to be sure that these activities do not put anyone at risk for fires or burns. This section of our website includes valuable information about fire safety and preparedness while spending time outdoors. When camping, it is essential to take special care with flammable liquids and any open flame near tents. Before leaving a campsite, make sure the fire is properly extinguished — douse and stir the fire with water. Taking a little extra caution is well worth it on a camping trip — whether it is in the backyard or the open woods! Have fun while being safe. Secure the proper permits to build a campfire. Scrape away grass and needles within a diameter of ten feet. Build your campfire or cooking fire downwind, far away from your tent. Have water nearby before building a campfire. Never use a flammable liquid (especially gasoline) to start a fire or hot coals. Adults should always supervise children around fires; never leave a fire unattended! While using campfires and grills, wear snug-fitting, tightly-woven, or short-sleeved garments; avoid sandals or open-toed shoes while cooking. Before leaving your campsite, make sure the fire is properly extinguished and douse with water. An extinguisher of some type (shovel, bucket of water or fire extinguisher), is an important tool for campers. Barbecuing outdoors is fun, but accidentally finding carelessly dumped hot coals can be a painful experience. Prevention is the only cure for a burn victim. Always wear sandals or shoes getting to and from the beach to avoid hot, buried coals. Be aware of tar and hot coals from the fire rings on the beach. ONLY dispose of hot coals in proper containers; do not cover hot coals with sand! Buried coals remain hot for up to 24 hours and may cause a serious burn injury to an unsuspecting beachgoer. Gasoline serves a very useful purpose. However, gasoline injuries are a major cause of thermal burns in the United States. It is important to know that gasoline and flammable liquid-related burns are a preventable problem!! When filling a gasoline container, leave about two inches of space at the top of the can for proper ventilation. Always fuel power equipment outside where there is adequate ventilation to disperse the vapors; use a funnel to prevent spillage or splashing. Never fill the tanks of gasoline-powered equipment when engines are running or when they are hot. Store gasoline in safety cans which have flame arrestors and pressure-release valves. Do not store gasoline in your home; have a safe place outside in a shed to properly store gasoline. Take care when storing aerosol cans or flammable liquids. Do not use when an open flame is nearby (including pilot lights used in stoves, dryers and hot water heaters). When summer is here, it comes with a wide array of fun outdoor activities like family barbecues, trips to the beach, and campfires, just to name a few. 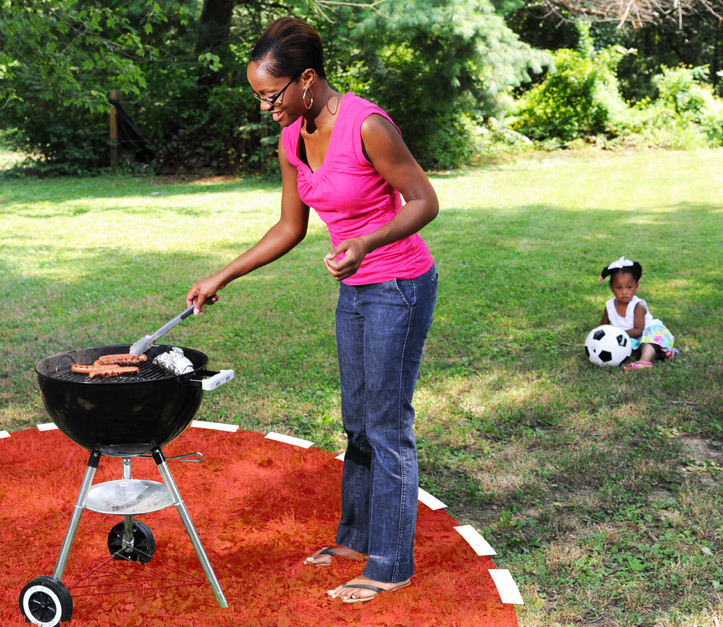 Make sure your summer outdoor grilling plans don’t include a trip to the emergency room. Use only charcoal lighter fluid to start a fire. Once coals are ignited, never add more charcoal lighter fuel or other flammable/petroleum based products to the fire – the container may explode in your hand! Dispose of used coals in proper containers. Be sure propane grills have the correct setting when being installed. Use grills at least 10 feet away from your house. Keep children and pets away from grills when in use. Dispose of hot coals in proper receptacles – buried coals retain heat for up to 24 hours and may cause a serious burn injury to an unsuspecting passerby who steps on them. It is known as the best season of the year to many: SUMMER. However, this fun-filled season can bring damage to your skin if you do not act with caution while outdoors. Block the sun, not the fun!! If you cannot cover up, use a sunscreen, which has Sun Protection Factor (SPF) of at least 15. Make sure it has both Ultraviolet-A (UVA) and Ultraviolet-B (UVB) protection. Reapply it every 2-3 hours, as well as after swimming, paying particular attention to the most exposed parts of your body – the face, neck, ears, shoulders, back, knees, and tops of feet. Read and follow the manufacturer’s recommendations on the bottle or tube of sunscreen. If applying more than one substance on your skin, always put the sunscreen on first and wait 30 minutes before applying the second substance. Always test for an allergic reaction when first using a sunscreen. Remember that no sunscreen offers 100% protection. Apply sunscreen and then cover up with a hat, long sleeve shirt and pants. Limit the time you spend in the sun. Set a timer or alarm if you think you may fall asleep. Do not overdo it when the weather starts to turn warm. Begin with 15 minutes a day, and then slowly increase the time you spend in the sun. Wear dark sunglasses to protect your eyes. Be particularly careful if you are taking prescription medication. Certain medications can make your skin more sensitive to UV rays. Consult your doctor if you have any questions about your medication. Apply a lip balm with sunscreen. Reapply frequently. Be cautious of metal and plastic playground equipment that is exposed to direct sun. Contact burns can easily occur. Fire Safe Kids is a Burn Institute Fire Safety Program. Check out the BurnInstitute.org. ©2017 Burn Institute. All rights reserved.